Eggs and truffles are a match made in heaven. Serve the eggs with half their pretty shells left on, allowing guests to peel and dip the rest themselves. For an extra special touch, stand the eggs upright in scattered Fleur de Sel or another coarse sea salt to serve. Cook the eggs in a pan of boiling water for 2 minutes 45 seconds. Drain, then cool under running water until completely cold. Chill until ready to serve. Stir together the mayonnaise, the grated truffles and the juice from half of the lime. Cover and chill. To serve, peel the top half of the shell from each egg and arrange the eggs in a shallow bowl. Cut the remaining lime half into wedges and serve on the side for squeezing extra juice into the mayonnaise if desired. Spoon the mayonnaise into a small dipping bowl. 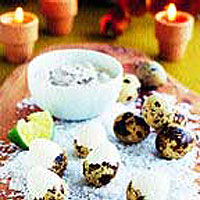 If you cook fewer quail eggs, reduce the cooking time - refer to the pack instructions. Prepare the mayonnaise and eggs up to 4 hours in advance.